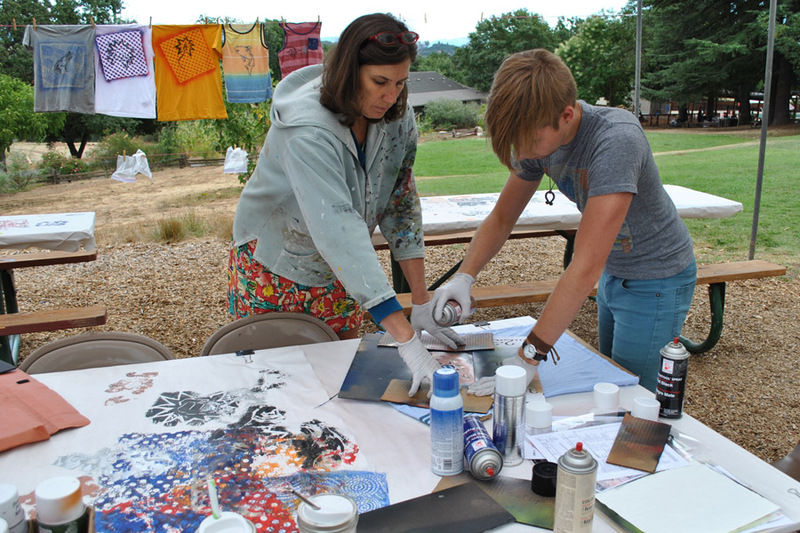 A couple of weekends ago I taught a Mixed Media Art Journaling class at the Mendocino Art Center. The center is located in the quaint artsy coastal town of Mendocino in on the Northern California coast. It’s a beautiful little town and a lovely place to teach. On Saturday, after teaching, I made my way to the local bookstore and as I often do, I found myself thumbing through the poetry section. This poem of Mary Oliver’s spoke to me and I used it as my inspiration for my Sunday demonstration in my workshop the next day. The poem speaks to where I am right now- “I have work to do”. I had a summer with busy parts and lazy parts, visits, travels and guests. It is wonderful to get out of the routine, get out of the ordinary, to play with the rhythm of the day and the rhythm of the week. But at some point it is time to return to ordinary time. There is comfort in the return – the structure of rising early, exercise, and getting down to the business at hand. This week was that for me, doing Ranch work, making sketches for a commission, meetings, emails, even this blog, all of it. My to-do list has been sitting ignored for some time now and this week it’s boxes were checked, things completed new items added. It is both daunting and invigorating to return. So forgive me if I brush past you in my bustle, like the sea, “I have work to do”. 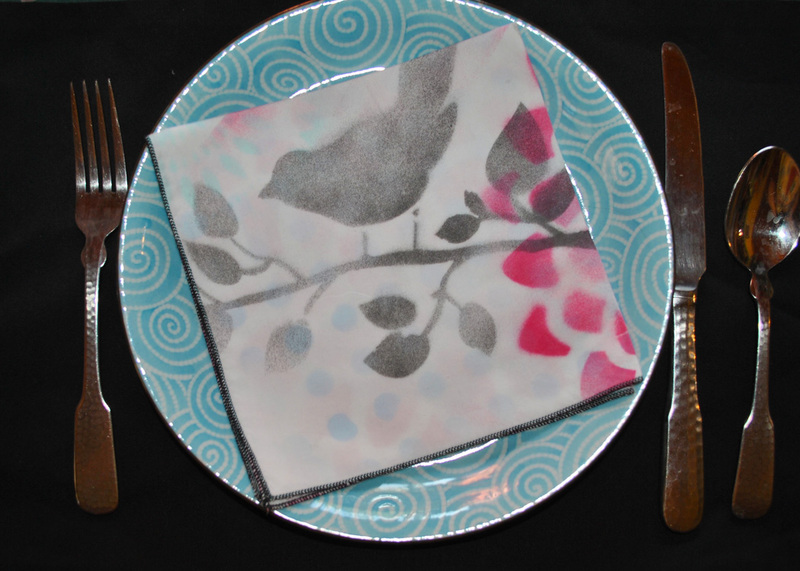 Black bird- Napkin is spray painted on cotton sateen- machine washed and serger hemmed. 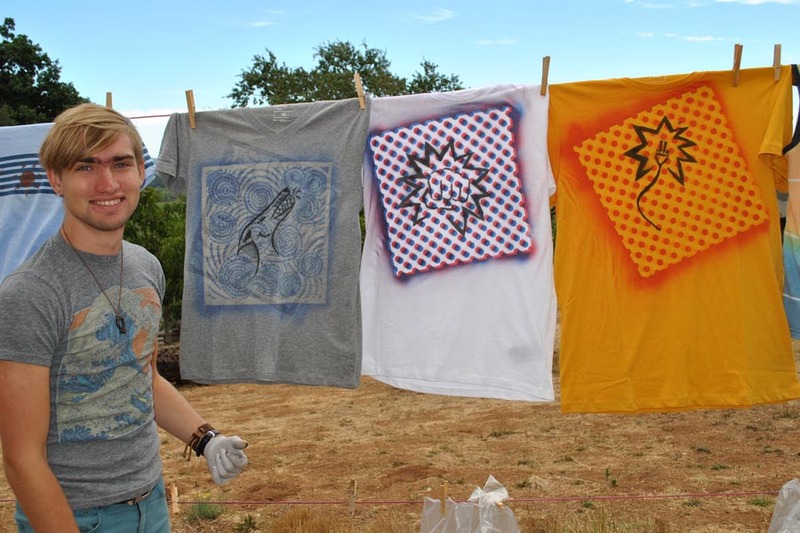 As you all probably know if you have been following for awhile I have been spray painting everything I can think of; fabric, wood, paper anything and everything is fair game for my spray paint experiments and I am in love with the results. Now I have a new amazing tool in my toolbox that I have been lusting after for years. For my birthday a while back my husband got me a serger also called an overlock machine. It is what makes a finished edge in most manufactured clothes and can create a rolled hem…for you stitchers out there you know this is an amazing tool. Don’t worry faithful Bernina sewing machine you will always be my first love but the Juki serger can do things you can’t. 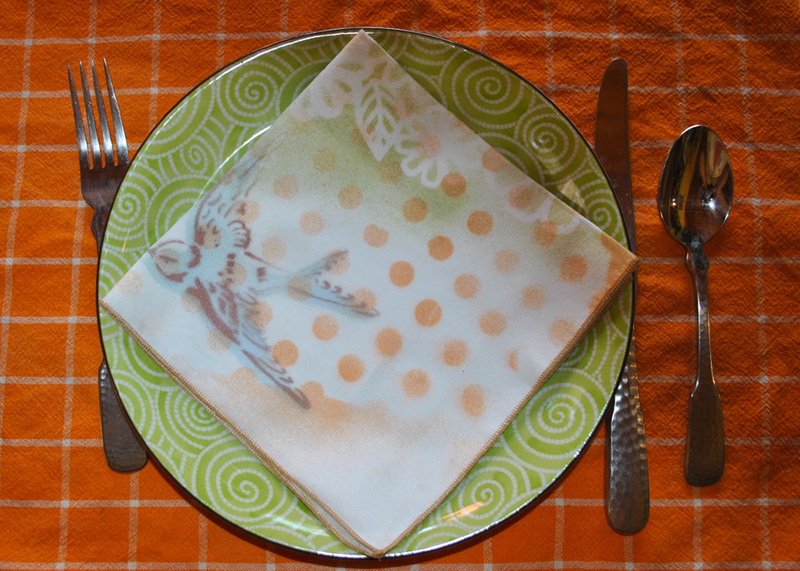 So now I have combined my obsession with spray paint and the wonder of a machine rolled hem and created these, if I do say so myself, fabulous napkins. I am getting ready for a studio sale in a few weeks and I’m in frantic maker mode. These little beauties with be one of many creative wonders for sale. The sale is November 19th-20th from 3pm-7pm both days. If you are local I hope you will come by and bring some friends. The sale is in my studio at The Bishop’s Ranch directions. 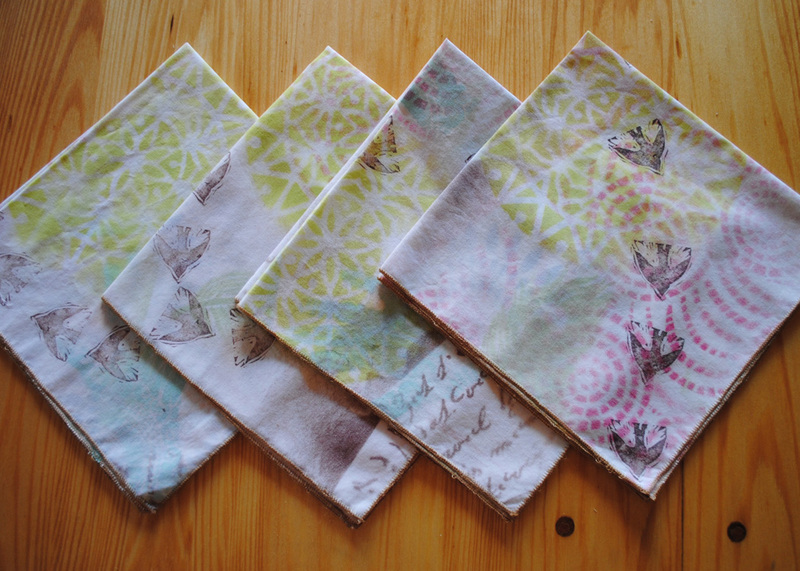 For those of you far away I’ll be putting the napkins on my Etsy shop soon (not there yet – no time ugh I need an assistant!) here is a link to that anyway because there is some sweet stuff that will be out to view at my studio too. 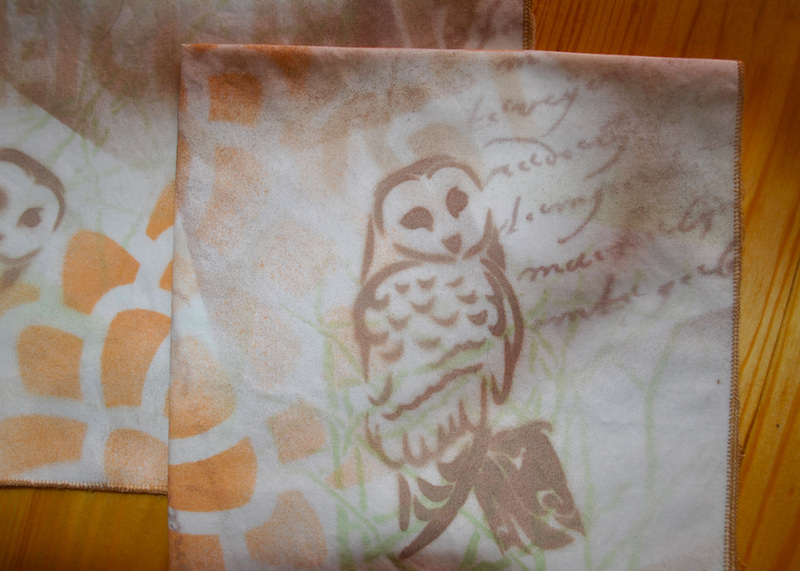 In Flight- Napkin is spray painted on cotton sateen- machine washed and serger hemmed.